CTU files its 10-day strike notice. Reboot Our Schools – The Chicago Teachers Union filed its 10-day strike notice. CPS has budgeted up to $25 million for a contingency plan. According to district documents obtained by the Chicago Tribune, CPS plans to open 145 schools from 8:30 a.m. to 12:30 p.m., Monday through Friday, for student activities. The district also plans to partner with other city agencies, faith organizations, nonprofits and other groups to provide places for students to go. •Schools opened during a strike will be selected based on location, with preference given to schools with “strong leadership,” air conditioning, gymnasiums, cafeterias, computer labs and easy access to public transportation. Children will be invited to participate in activities such as independent reading, writing, the arts, athletics and computer work. •Students would be provided with breakfast and lunch at all facilities. •As many as 80 summer camps run by the Chicago Park District could be extended and 79 Chicago Public Library branches could be available to provide online learning opportunities. Reboot Our Government – Standard & Poor’s downgrade of Illinois’ credit rating to the sixth-highest rung of its ratings ladder — Congrats, Illinois, you’re a sixth-rate state! — aggravates a debacle that’s already costing taxpayers some $550 million a year. The Tribune’s translation: Wake up, Illinois taxpayers. Your politicians are do-littles who hugely raised income taxes and still didn’t fix their doomed pension system or their budget, bedeviled as it is by billions in unpaid bills. As your credit rating keeps going down, the amount of surplus interest you foolishly pay to buyers of your bonds probably keeps going up. When you cast your ballots in 68 days, will you enforce consequences on the incumbents who won’t take steps to reduce your vast indebtedness? The legislators who have turned Illinois into a sixth-rate state? Or will you let them get away with that? Reboot Our Pensions – Quinn used the downgrade to again call for lawmakers to take up pension changes, saying he will convene a meeting with legislative leaders on the topic next month after he returns from the Democratic National Convention. Reboot Our Finances – Year upon year, deal-cutters in the General Assembly collect fat donations from gambling interests and dutifully write legislation to massively expand the industry’s reach in Illinois communities. The sponsors promise that massive expansion will bring vast new revenue to Springfield. They don’t boast, though, about how they buy the votes for passage by earmarking a huge share of that revenue for their fellow legislators’ pet causes and projects. Most dangerously, the sponsors punctuate thick expansion bills with sneaky ethical loopholes. Quote of the Day – “We’re not going to have loopholes for mobsters in Illinois.” – Gov. Pat Quinn (D-Illinois) on his veto of the gambling expansion bill. Reboot Our Schools – The Chicago Teachers Union plans to file a 10-day strike notice later today, meaning a teacher walkout could begin after the majority of the city’s students finish their first week of school, sources said. The union and CPS have been in talks for months but have failed to reach agreement on a number of matters, among them salary, pay hikes based on experience, a re-hiring policy for teachers who’ve been laid off and job evaluations. Our children belong in the classroom, not the streets. We extended the school day so that ours is not the shortest day in the country anymore. The CPS raised property taxes, cut costs and drained all its cash reserves just to make ends meet this year. The money they had set aside for salary raises was used to hire 477 additional teachers to fill the longer school day instead. Stat of the Day – Illinois has the 5th highest debt in the nation, according to State Budget Solutions’ State Debt Report 2012. 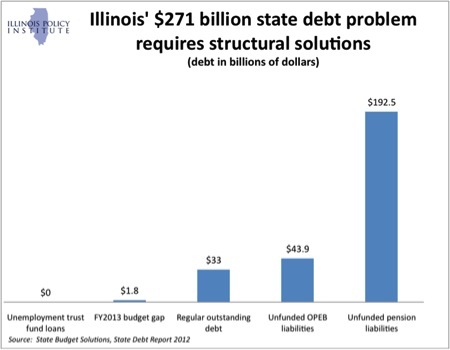 Our total outstanding debt is now $271 billion, or $21,000 per Illinois resident – over 70% of which comes from Illinois’ unfunded pension liability. Reboot Our Transparency – Two boards appointed by Mayor Emanuel took steps to tighten city ethics rules and enforcement. An ethics reform task force appointed by Emanuel released its second report, making 21 new recommendations designed to ensure greater compliance with city ethics and campaign finance rules. Meanwhile, a controversial board set up to lure private investment for public works agreed to fall under the jurisdiction of the city inspector general. Among the ethics reform task force recommendations were proposals to broaden the definition of lobbyist to include agents for nonprofit organizations and allow anonymous complaints to be filed against aldermen and their staffs. It also recommended making the city Law Department the prosecutor of alleged ethics rules violations and campaign finance infractions. And it suggested that the Board of Ethics determine if violations have occurred and mete out sanctions. Pension reform. Education reform. Common core standards. Budget cuts. As we start a new school year in Illinois the most important priority is probably the least discussed: The children in our public school systems, according to Dr. Brent Clark, Executive Director of the Illinois Association of School Administrators. Seventy-seven percent (77%) of the public school children in Illinois met or exceeded the standards for all standardized tests last year. That’s a 28% improvement compared to the 60% that passed in 2002, according to the Illinois Interactive Report Card. Public education never has been more challenging given the deep budget cuts in our state that have included an 11% decrease in General State Aid and a 42% cut in transportation funding. Illinois is dead last in state support for public education. “If we come to the end, and it’s a choice between a ridiculous settlement and a strike, we would take a strike. People went into negotiations with Daley knowing he was allergic to strikes. He wound up giving a ton in the end. This mayor can’t cave. It’s what he ran on. The kids will have a longer day, and he’s not gonna bankrupt the system to get it. The only way to do that is to have a more sane contract. He sees this deal as fundamental to that.” – A confidential source close to Mayor Rahm Emanuel (D-Chicago) on contract negotiations between the CPS and CTU. Gov. Quinn must decide today whether to allow a gambling expansion bill to go into law, to veto it, or to change it. The bill, which has been on the governor’s desk since June 29, would bring casinos to Chicago and to several suburbs. It also calls for legalizing slot machines at Illinois horse racing tracks. Good for Quinn for not letting Springfield lawmakers take the easy way out on making some tough decisions. Gambling expansion is not a quick fix to solving our state’s financial problems. The Teachers Retirement System, by far, consumes the lion’s share of Illinois’ unfunded pension debt at 60% ($376.5 billion). Next is the State Employees Retirement System at 21% ($132.3 billion), followed by the State Universities Retirement System at 18% ($115.6 billion), and the Judges Retirement System ($6.7 billion) and General Assembly Retirement System ($800 million) both making up 1% of the debt, according to the Illinois Policy Institute. Illinois already spends more on pension costs ($6.75 billion this year) than it spends on its schools ($6.2 billion), according to the Chicago Tribune. The longer this state’s leaders skirt pension reform, the likelier the rest of us are to be stuck forever with the allegedly temporary income tax hike that’s scheduled to expire after 2014. This linkage — their pension fiasco, your income tax — is of grave import in this election season. As you make your choices in legislative races, we urge you to press every candidate on whether he or she will, or won’t, vote to extend the increases enacted last year: 67% on individuals, 46% on employers. Take as a “yes” any vague answer like: We’ll have to see where we are two years from now. So many candidates this year are hiding behind that evasive line, speaking nearly identical phrases that sound like predigested talking points from their campaign advisers. Remind the candidates that a tax hike sold to Illinoisans as temporary needs to be…temporary.